The Birthday Party Checklist is the perfect tool for anyone wanting to plan the perfect party. 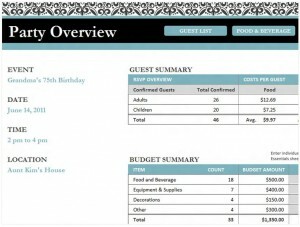 Guest lists, a budget, menu and vendor information are all combined in one easy to use document. This fun, user-friendly template is available to download for free on this page. This customizable Birthday Party Checklist is a great organization tool that is essential for anyone planning a birthday party. First, fill in the general event information on the first tab labeled Party Overview. This includes the event name, date, time and location. The guest and budget summary will be filled in automatically after other portions of the Birthday Party Checklist are entered on other tabs. There is also a column for the actual cost of each item so budgeted cost and actual cost can be compared. Second, click the Guest List tab at the bottom of the spreadsheet. Enter the family name, their address and how many children and adults are in the family. Once their RSVP is received, enter that information, as well. RSVP information will be automatically summarized on the first tab of the Birthday Party Checklist. Third, click the Food & Beverage tab. Enter food items and approximate number of servings that will be needed for children and adults. Then enter the cost per serving. The spreadsheet will automatically calculate cost per child and adult based on number of servings for each. It will also generate the total cost based on number of children and adults that are attending. The total estimated costs for food will also be automatically added to the budget summary on the Party Overview tab. Fourth, click the Other Essentials tab. This portion of the Birthday Party Checklist includes vendor information and decoration costs. There is also a column where the user can enter whether an item has already been purchased. These totals will also be added to the budget summary. Finally, a tab is also available with a printable Seating Arrangement sheet. The sheet contains recommendations for seating arrangements and allows the user to sketch potential arrangements. This Birthday Party Checklist allows users to plan every aspect of their party in such detail that the stress of party planning disappears and the host or hostess can enjoy the party just as much as the birthday girl or boy.